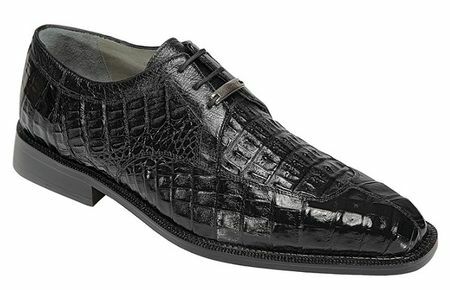 When it's time to treat your self to some of the very best mens black crocodile shoes that money can buy, it's time to treat yourself to the Susa by Belvedere Shoes. The Susa are the best hand made mens black crocodile shoes regardless of price and there is simply no better made shoes on this planet because of the style,skill and craftsmanship that goes into each and every pair. From the moment you take these mens black crocodile shoes out of their flannel shoe bags straight from the box, you'll know right then and there you've made an excellent choice. The Susa by Belvedere is a split toe all over crocodile skin shoe with just a bit of ostrich skin trim to give some contrast. Like all Belvedere shoes, these are hand made with full lambskin leather linings and hand made full leather stitched sole and heels.